Well I made a purchase through him, did not like what i got so i returned it. He feels as though i am working for some guy from Leaf Only and that i just wanted to find out what he was selling. Long story short is i returned the tobacco with DC and he is not giving me a refund. here is the email conversation. Yeah, right...you're going to leave negative feedback any way i refund you're order. You're a plant from LeafOnly and I don't sell on ebay anyway. Go ahad and leave your feedback. I'll be smoking LeafOnly sooner than they can say "fire it up"
Cute maneuver Rich. I never knew about you before I started WholeLeaf. You will soon learn you've chosen the wrong enemy. messing around... this is easier to do with the thinner wrapper leaves, the thicker, ie. Maduro is hard to do this with. I just can't get over how awesome this pigtail is! Amazing work Andrew!!! I opened a dispute in payfail and he refunded the money... all is good. So I have been rolling more and more of my own. It certainly is time consuming, but it's been fun. I don't have any molds, but after watching a slew of videos on youtube (Hamlet, La China, Reynaldo, etc.) I am getting better and better. I have even done a lancero without a mold and I am getting pretty good at lonsdales. One thing that is of upmost importance is when you get the leaves in, make sure to go ahead and sort them and flatten them out. This bit of prep work helps immensely when going to roll. Any of you that are rolling have any tips about sorting and flattening? I also wanted to add, that while the leaf I have now is not the best quality out there. ( I may get some better variety next time) the flavor has been very good. I would put it up there with any $5-$8 smoke. any one know where I can find a tuck cutter? Check on eBay every now and again under the search terms "antique cigar" or antique cigar cutter. A new one costs about 175$ I will keep my eyes open as I've seen a few. Have any of you home rollers tried the Nicaraguan Viso from otoaocigars? If so, how does it compare in taste/flavor to the '98 Ligero? how has the tobacco been from Otoao? i noticed earlier that you had posted something about opening leaves. do you have to open and flatten your filler? or are you just referring to the wrappers? I haven't bought any from Otoao, but that Viso has me wanting to buy from him. I have only bought from leafonly. I have had to flatten and partially unroll the leaves I was sent of the aged Nic Seco and aged Nic Ligero. And I have been using the havana 7 as a binder and doing prep work by de-stemming it and flattening them as well. 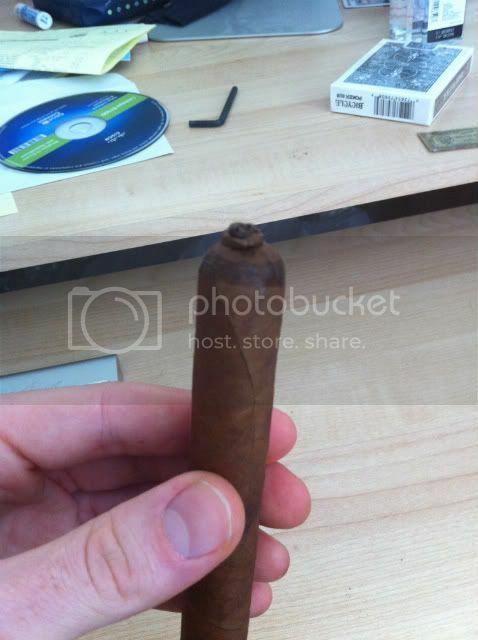 Then there is the Havana Prime I use for my wrappers and I de-stem and flatten them out as well. So when I go to roll it's a easier and less time consuming. I flatten the filler because I find it easier to bunch that way. I get a good spiral. i found that using the Havana 7 as the binder and the Havana prime for the wrapper works very well. the prime is very easy to work with. 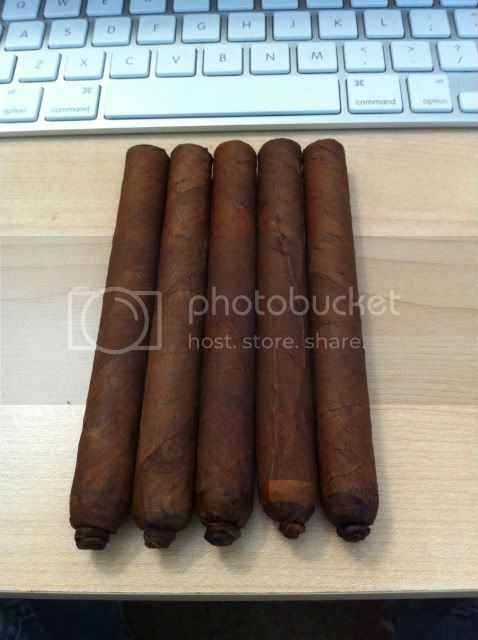 I did notice some of my seco and ligero had bunched up or rolled. now that i know what you mean i have had to open some up but i am able to do that when bunching. as far as Otoao, i think you have to call and place an order or do it through email, i do not know how secure his transactions are with a credit card and honestly that is the only thing holding me back. This is correct and the purchases I have made so I have not had any issues months after. Great guy to work with. Very friendly and makes you feel like a part of the family. As for the Viso I'm not sure what to think on it. It is more of a mellow out Nicaraguan but with some body. As far as the '98 Ligero Nic goes it is a completely different tasting lave. More spicy. His fillers and seco are great tasting and the Ecudorian sumatra binder is yummy. All have that nice aged taste after letting rest a few months in the humi rolled. I really only shop at leaf only now till I find a better priced tasting wrapper out there. It'd be nice to find a few farms from the country of origin to purchase from and go that route to save $$ but I don't usually buy over a lb of binder,lb of wrapper or so forth of the other leaves at a time . To even get ins to some of the big name cigar companies leaves would be nice as well. So blkdrew, what sizes are you rolling now? I enjoyed the last 5er and thinking about trying another size if you make them. I want some of the 42's! Do you have stock? I will get on it this week, I currently have 5 which are spoken for. I will have stock next week. Andrew, did you ever find any boxes to box your own?